One woman is dead after a gunman being chased by police entered a Silver Lake Trader Joe's Saturday afternoon, held several people hostage and engaged in an hours-long standoff with police before eventually surrendering. The LAPD confirmed the suspect was an adult male in his late 20s, and the police pursuit stemmed from a shooting that occurred at 1:30 p.m. on the 1600 block of East 32nd Street in Los Angeles. Police said the suspect shot his grandmother, a woman in her 70s, and a second woman, a person in her 20s later confirmed to be the suspect's girlfriend. Authorities confirmed the suspect had shot his grandmother as many as seven times and that she was in critical condition. The suspect got into his grandmother's car with the second woman and fled the scene in the 2015 Toyota Camry, LAPD said. After the vehicle was located in the Hollywood area by a tracking system, police began their pursuit there and the chase ended in front of the Los Angeles store. When Newschopper4 Bravo arrived over the scene at approximately 3:30 p.m. local time, the vehicle was crashed into a pole near the store. The suspect "jumped out of the car, and it looked like he shot some rounds off when he got out of the car," said Dan Zito, who said he was only feet away from the crash. Police then "returned some fire at him, but he ran straight in" Trader Joe's. Moments later, LAPD approached under heavy caution and rescued the woman, who was left behind in the pursuit vehicle. She was taken to a nearby hospital with a grazing wound. 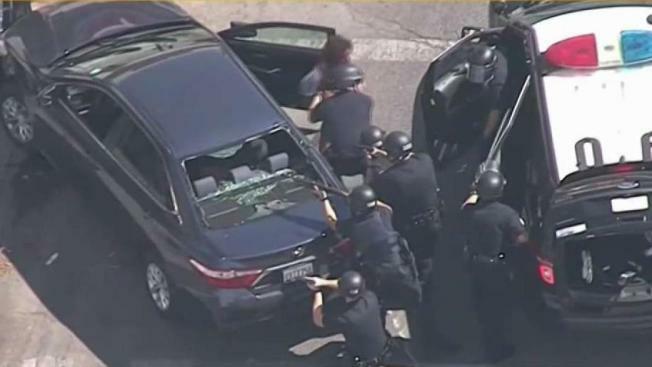 Newschopper4 was able to view LAPD tactically working to rescue employees and customers trapped inside. Both customers and workers could be seen running from the store to safety, jumping out of store windows and escaping down a ladder at a window. Police had immediately surrounded the Trader Joe's and were working to take control of the store. "I’ve never seen so many police in my life," Derek Anthony, who has lived in the neighborhood for 15 years, said. The Los Angeles Fire Department also responded to the scene and stated that 100 firefighters and 18 ambulances had been deployed to the scene. Anthony said he saw the end of the pursuit: "The car had heavy damage, had flat tires and (the suspect) was still careening around the corner with all the police behind him, and he was shooting his gun as he came around the corner." After the barricade situation began, a young male hostage was able to walk out of the front door with his arms raised, and he was taken to safety. L.A. Mayor Eric Garcetti later confirmed that one person, a woman, was shot and killed inside the Trader Joe's. She was an employee, and her body was dragged out by another Trader Joe's employee early in the standoff. The woman was the only confirmed fatality from the store. The barricade was still active by 5:15 p.m. SWAT vehicles were in position and a location to perform emergency triage had been set up. The barricade lasted about three hours and ended about 6:40 p.m. Five hostages exited the front doors of the Trader Joe's with the suspect also exiting in handcuffs. He was quickly taken into custody against a side wall, while the hostages left without further incident. Police said they were in contact with the suspect during the "horrific" standoff, and the negotiation team included a psychologist and tactical members. "That dialogue resulted ultimately him handcuffing himself and coming outside and surrendering to SWAT," LAPD chief-of-police Michel Moore said at a news conference. The investigation into the hostage situation and death of the woman is ongoing, and the pursuit vehicle remained on the scene late into the night. The LA Fire Department said it evaluated a total of 10 patients at Trader Joe's. Six patients were transported to the hospital, including a 12-year-old boy. With the exception of the woman who died, those taken to the hospital related to the incident were in fair condition. A family reunification center is located at LAPD HQ Northeast Division at 3353 North San Fernando Road for those involved in the incident. The number to call for further support information is 323-561-3211. The LAPD also stated that Hyperion Avenue would remain shut down between Griffith Park Boulevard and Ettrick Street until noon on Sunday. Trader Joe's PR director Kenya Friend-Daniel said in a statement, "Our hearts are broken over what happened today. This has been an incredible trauma, and our thoughts are with our Crew Members and customers. Our focus is on doing whatever we can to support them at this time. We appreciate everything Los Angeles law enforcement did to ensure an end to this ordeal."